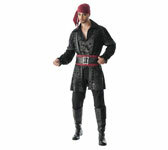 Rubie's Adult Black Beard Pirate Costume. Size (Adult): STANDARD (fits up to 44 jacket size). Buccaneer Series by Rubie's Costume Company.